I wanted to give you an idea of the Parade Route. This is unofficial, but basically gives you an idea, from the starting point at Caribbean Cinemas (Choc) to the centre of town, Castries, an estimated route of under 4 miles. From Point A to Point B, revelers enjoy jumping on the Castries/Gros Islet Highway. Point B on the map is the Central Castries Market, it is also one of the most important judging points. From Point B, there is a change in the vibe, especially depending on which turn your band makes here. Revelers are intoxicated, spectators now join in the band (no security presence like Trinidad), as city streets also get narrow. This truly is where it gets congested. Music trucks slow down, revelers stall and it gets backed up. From this point, I'm ready to call it a day, 'though I use this as the time to jump in other bands, connecting from one side street to the next. Joining another band is not really allowed but we all have friends in various bands. Unlike Trinidadians who opt for Carnival Monday wear, St.Lucians wear FULL COSTUME on both days. Also Carnival Monday is our main judging day. So FULL COSTUME is a must. Carnival Monday should start by 10AM. 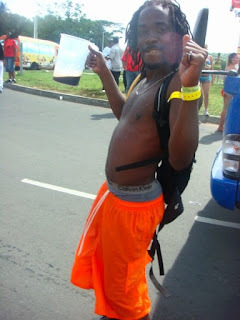 Carnival Tuesday is half day work, so the parade starts after midday. So no stops for lunch, like in Trinidad. Unless, you're lucky to catch a snack/lunch truck which usually lingers till most of the band is long gone. 'Though all-inclusive drink trucks have always been a part of our carnival, the service is so-so. Both Just 4 Fun and Red revelers have complained about slower service, excuses like "we only have water now, or no water now, or we ran out of ... , wait till we restock, etc." The only band whose revelers never complain about the continuous flow of liquor is Rituals. Nonetheless, you will get liquored up. Some still walk with canteens, fancy pimp cups, bowls. Any container that holds liquor, a Lucian will drink out of it! Just like this guy I took a picture of in 2008, with his jug. All in all, get ready to have a good time. Expect soca music infused with a strong French sound, maybe you'll learn some patois too. Expect to run, if you're a straggler such as myself. Expect madness. Expect no one to get into sections, 'though it would be nice for judging points. Despite the band, (below Andra was in Red and I was in Just 4 Fun)... expect at the end of it all, the feeling of not wanting to go home. 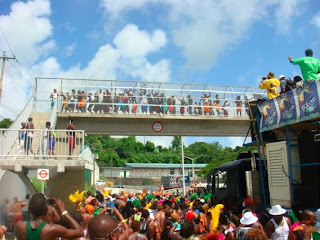 Even my daughter, then only 1 year and 9 months old enjoyed St.Lucia Carnival 2008! She danced to her favorite soca song for 2008, Ashanti's "Wine on Your Boom Boom"